GameStorm is hosting an free Game Day at the Vancouver Hilton today, October 5th. Bring a friend and join us for a full day of tabletop play! The Game Library will be present with several hundred titles to choose from. Try something new or show off something you enjoy playing. 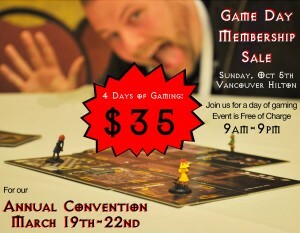 Memberships for our March convention will be available for purchase at $5 off the early bird rate on site. That’s 4 days of gaming for just $35. The event runs 9 am to 9 pm and is open to the public. Come on down to have some fun with us and see what GameStorm is all about.